OAKLAND, Calif., April 24, 2018	(Newswire.com) - Dictum Health, Inc. – innovators in telehealth's Virtual Exam Room (VER) technology that supports patients across the continuum of care – is excited to announce the addition of video laryngoscopy to their end-to-end telehealth solution. The laryngoscope created by Vivid Medical is a single-use video intubation device that performs reliably during concurrent chest compression, on patients with an immobilized neck or in any position, and with successful suctioning of the airway by the same person performing intubation. 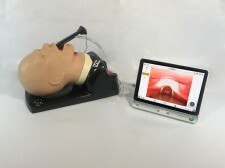 The device connects through USB to Dictum Health's IDM100 Medical Tablet, which displays video images of the mouth and throat to guide intubation and to record and store images to Care Central cloud services. "The unique No-Force (Point and Intubate) technique used with the Vividtrac is even well-tolerated by conscious patients, which makes the VividTrac one of the safest devices on the market today, with adults and pediatrics alike," said Mina Farr, Founder and CEO of Vivid Medical. "The partnership of Vivid Medical and Dictum Health has broadened EMS clinical capabilities, which can only result in better patient outcomes." Laryngoscopy is supported by Dictum Health's complete Virtual Exam Room (VER) product line including the VER-CLINIC telehealth cart, VER-GoCLINIC pop-up telehealth clinic, and VER-MEDIC ruggedized telehealth case. Video laryngoscopy has become the standard of care for improved patient intubation in the operating room. With Dictum Health's VER telehealth system, use of video laryngoscopy is now more accessible to EMS and ER departments. "Partnering with Vivid Medical to add video laryngoscopy to our VER products expands the definition of clinical telehealth from incident to hospital," said Elizabeth Keate, VP of Product Management at Dictum Health. "Additionally, because the VividTrac is single-use, we are able to eliminate the risks of patient cross-contamination, important for rural clinics, military, emergency, and disaster relief situations." Vivid Medical is the recipient of the 2013 EMS World Innovation Award and the JEMS Hot Product of the year in 2013 for the Adult VividTrac and in 2014 for the Pediatric VividTrac. Dictum Health will demo the VividTrac alongside their VER product line at the American Telemedicine Association Conference in Chicago, Illinois April 29-May 1. Vivid Medical, Inc. is a medical device technology and manufacturing company that develops high quality, open system, superior medical vision devices that are compatible with today's digital environment and standards. Founded in 2007, its goal is not only to deliver the safest possible solution, where and when it's needed, but also to revolutionize medical imaging systems, by offering the highest quality digital endoscopic vision at an affordable price.